Gallia Academy senior starter Kaden Thomas delivers a pitch during the seventh inning of Thursday night’s OVC baseball contest against Coal Grove at Eastman Field in Centenary, Ohio. Senior Kaden Thomas provided seven quality innings while becoming the first Gallia Academy pitcher not named Josh Faro to win a game this year following a hard-fought 3-2 victory over visiting Coal Grove on Thursday in an Ohio Valley Conference baseball contest at Eastman Field in Gallia County. Thomas was extremely efficient in his complete-game decision as the right-hander struck out 10 while allowing only six hits and zero walks over seven innings on the mound. The Blue Devils (8-8, 6-4 OVC) needed that quality start as the hosts mustered only three hits in the contest, but the Blue and White also made the most of those limited opportunities. The Hornets (7-4, 4-4) built an early 1-0 lead as an error allowed Jordan Case to come home with two outs in the top of the first, but the Blue Devils countered by taking advantage of an error in the home half of the first as Cole Davis — who reached second on a miscue — scored following a two-out double by Morgan Stanley, tying the game at one apiece. Gallia Academy kept things moving forward in the bottom of the second by loading the bases on walks, then a two-out wild pitch allowed Wyatt Sipple to come plateward with what proved to be the eventual game-winning run while making it a 2-1 contest. The hosts captured their largest lead of the game in the bottom of the third as Faro was issued a leadoff walk, then Faro advanced to second on a one-out single by Matt Moreaux. Sipple followed with a single to left that allowed Faro to score, making it a 3-1 contest through three complete. 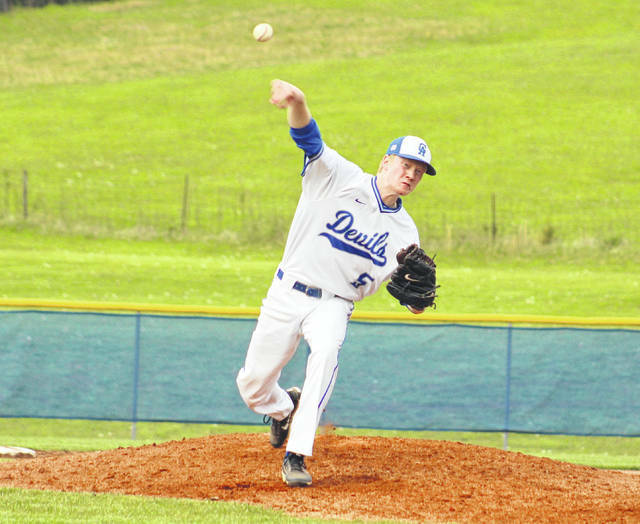 The Blue Devils mustered no hits and only two baserunners over their final three frames at the plate, but Thomas ultimately had all of the offensive support he’d end up needing. Sam Angelo started the fourth with a single, then Corey Borders brought Angelo home with a two-out single to center — making it a one-run contest. The Red and Black ended up leaving runners stranded at first and second in the fourth, then had nine straight hitters go down in order before Borders singled with one out in the seventh. Borders stole second and moved into scoring position with a stolen base, but Thomas fanned the final two batters to wrap up the complete-game triumph. Afterwards, GAHS coach Rich Corvin was complimentary of his senior starter, noting it was the kind of performance that this squad has been desperately needing over the last few weeks. And with the postseason tournament looming on the horizon, Corvin is hoping that this is the start of better things to come. “Kaden gave us an effort that we’ve been needing out there on the mound all year, so hopefully this will be a turning point for us,” Corvin said. “It was a great outing for him and for us, mainly because he didn’t allow a single walk in the game. The strikeouts were nice, but not giving up free bases was big because that’s hampered us a bit this year. The Hornets outhit the Blue and White by a 6-3 overall margin and both clubs committed an error apiece in the contest. Gallia Academy left seven runners on base, while the guests left four on the bags. Thomas was the winning pitcher of record after throwing 71 strikes in 102 pitches, allowing only one earned run in the process. Tate Matney took the loss after surrendering two earned runs, three hits and five walks over 5⅓ frames of relief while fanning three. Stanley, Moreaux and Sipple had the lone hits for the Blue Devils. Faro and Sipple each drove in a run for the victors. Angelo and Borders paced CGHS with two hits apiece, while Case and Compliment added a safety each. Borders drove in the Hornets’ lone RBI.